Vijay Talks About NOTA Failure! Vijay Devarakonda is highly vocal about his personal and professional life on social media. 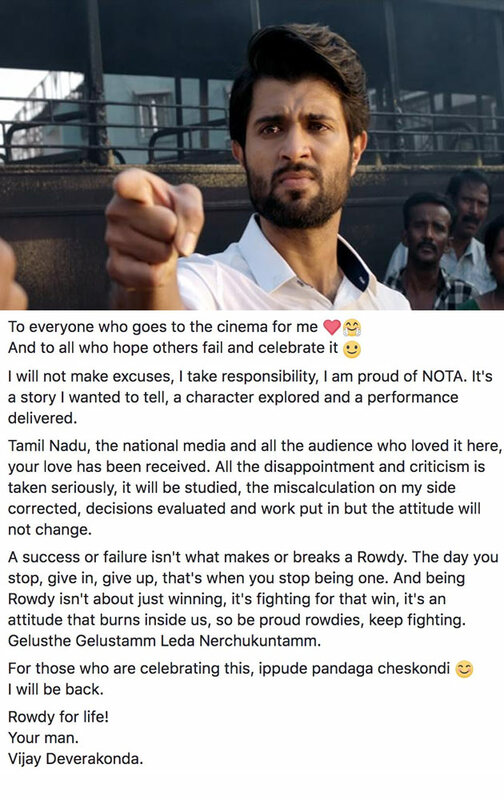 He maintains an attitude and in the same vain he gave reply to the NOTA trolls and about the failure of the film. He said, "Being a Real Rowdy means fighting to win but not to say that we never fail. We have to learn from it." He also welcomed all the praises and said that he took note of the criticisms. He wrote that he liked the story and wanted to perform in the character. He will evaluate the decision and necessary changes he promised. He also gave a slight warning to those who are celebrating his movie failure. He said that he will make a strong comeback and asked them to enjoy this time. He is the most sought after actor these days and he has big directors like Koratala Siva also looking to work with him. Let's see how he bounce back in action as he left word arrows for now! Padi Padi Leche Manasu Teaser: CLASSIC!